1-CD Digipak (6-plated) with 52-page booklet, 28 tracks. Playing time approx. 71 mns. June Carter's last great solo album was 'Appalachian Pride', dating from 1976, now reissued by Bear Family. Despite the fact that she grew up on the road with her famous mother, Maybelle, June has always been intensely proud of her family's roots in Appalachia. That was never more evident than on these recordings where she lends her personal stamp to songs like East Virginia Blues, Another Broken Hearted Girl and Big Balls In Nashville. Ben Dewberry's Final Run. Here's a rarely heard side of the late Johnny Cash. The Man in Black lightens up! 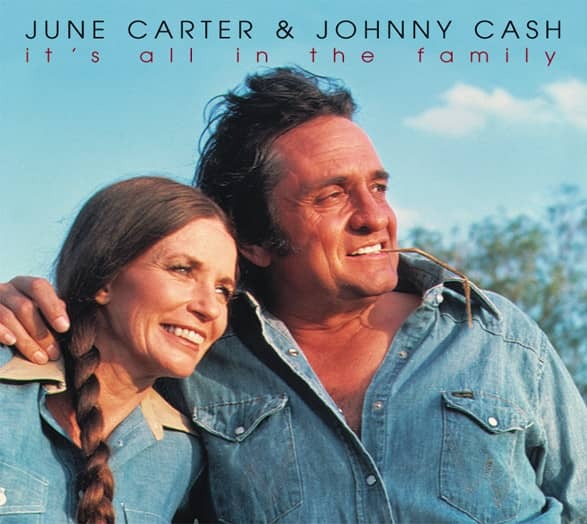 "June Carter & Johnny Cash"
"Suffer the little children to come unto me for such is the Kingdom of Heaven." These were the words spoken long ago by the Lord Jesus. In his wisdom he knew that the little children are pure, and that they believe in a good song. They hear the songs sung by people, and that same purity and goodness picks the good music from the bad. In the many years --31-- that I've been married to Johnny Cash, the little ones have come to him with the same sweet innocence that binds them to John as children and they stay bound throughout their life. His music has made them laugh, made them learn to cry, taught them history about a world they're just being born into. They learn to dance their first steps to some of his songs. This album is for the children, and the same bass voice that speaks true, sings out to them again, and pulls them into the light of this day and into what is happening now. May help them to learn their ABCs. May they learn the old stories about famous train wrecks, as Johnny Cash tells you the truth about Ben Dewberry's Final Run, and to set your clock by My Grandfather's Clock, and look through little Magic Glasses. Meet our daughter Tara in Miss Tara, and I had a great time with my daughter, Rosie Carter, about The Little Green Fountain. And I've got a boy (and his name is John). You're going to know Johnny Cash a lot better as he shares a boy's tragic day losing his dog, Old Shep. May we in our wisdom be more like little children, be loving, kind, and true. And Johnny Cash, after this album - little children will listen for you. And in her love I do abide. And she gives me all her heart. Customer evaluation for "It's All In The Family"
27 Why Is A Fire Engine Red?